Taman Mayang Jaya, Petaling Jaya. Business hours: 11.30am to 2.30pm and 6.00pm to 11.00pm. FAMED Hong Kong Ocean Shabu Shabu Restaurant is all set to make its mark in Taman Mayang, Petaling Jaya with its newly opened restaurant. Having made a name at their flagship restaurant in Seri Petaling, husband-and-wife team, Popeye Lee and Denise Chin decided to open a restaurant in Taman Mayang. Lee, who hails from Hong Kong, has had lots of experience operating 13 restaurants in London 10 years ago. He moved to Malaysia five years ago when he married Chin. One thing he noticed was the Malaysian steamboat had a marked difference from Hong Kong’s variation and aspired to be one of the pioneer Hong Kong steamboat operators in town. His chef from Hong Kong takes great pains to ensure everything including the soup is made to perfection. “Hong Kong steamboat is very different from the local variety, it is one of a kind,” said Lee. Hong Kong style: The famed Choi Yuk Wan fish, is springy and goes well with the chef’s special sauce. There are nine different types of soups to choose from including Pork Bone with Corn Broth, Chicken Marinated in Yellow wine broth and Thai Tom Yam broth. Lee and Chin insist on fresh ingredients when preparing the broths. 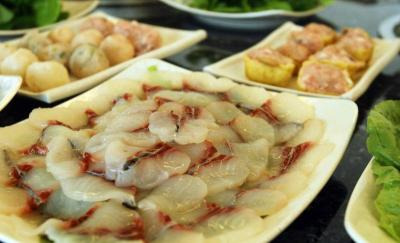 They have brought in the famed Choi Yuk Wan fish to Malaysia which is kept at the aquarium at their restaurant in Sri Petaling. Texture of the fish is springy and goes well with a special sauce made by the chef. Many choices: There are nine different types of soup to choose from. “Another popular item is the Four Seasons meatball that is handmade every day. 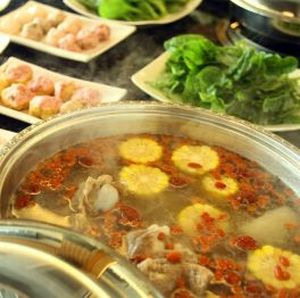 Since we offer a la carte steamboat items, diners can choose what they want for their soup,” added Chin. Diners can also opt for the famous Typhoon Shelter Crab which is said to have originated from typhoon shelters in Hong Kong. As a side dish, one can try the Hong Kong preserved eggs that goes well with pickled ginger. The new restaurant is spacious and has two floors with special rooms that have karaoke sets. Each room can accommodate 50 to 60 people for private dinner parties.